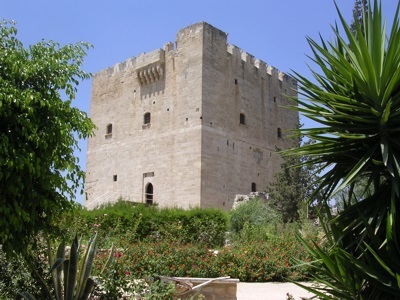 Welcome to Travel Guide 2 Cyprus, the site about travel, tourism and vacations in Cyprus. Cyprus (Greek: Κυπρος - Kýpros; Turkish: Kibris) - full name, the Republic of Cyprus (Greek: Κυπριακη Δημοκρατια - Kypriakí Dimokratía; Turkish: Kibris Cumhuriyeti) - is an island nation located in the eastern Mediterranean, to the South of Turkey. 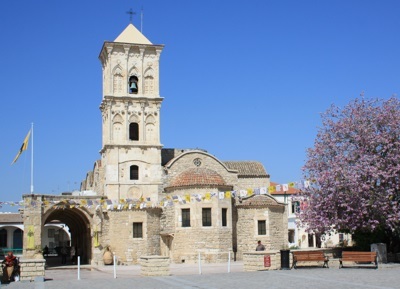 Cyprus is home to both Greek and Turkish Cypriot communities. In 1974, violence broke out between the two communities, and there was also an attempted coup d'état supported by the military junta that ruled Greece at the time. Following these events, Turkey invaded and occupied about one third of the island. In 1983, this part of the island made a unilateral declaration of independence as the Turkish Republic of North Cyprus (Turkish: Kuzey Kibris Türk Cumhuriyeti) (although its independence is not recognized by the United Nations, or by any country other than Turkey, Bosnia and Azerbaijan). The Republic of Cyprus thus has de facto control only over the southern parts of the island, even though it has de jure control over the Turkish occupied area as well. The northern (Turkish) and southern (Greek) parts of the island are separated by a United Nations controlled demilitarized zone known as the "Green Line". 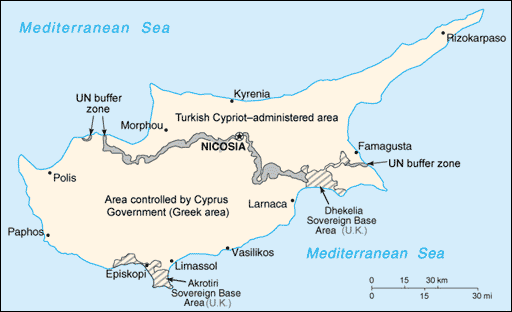 Additionally, Cyprus is home to two Sovereign Base Areas ( Akrotiri and Dhekelia) which remain under United Kingdom sovereignty). Cyprus has a modern, developed and prosperous economy mainly based around services, but with some light manufacturing, as well as significant tourism sector. Additionally, it should be noted that Cyprus is an important center for offshore business: companies which are located in Cyprus but only conduct business overseas are entitled to various tax and dutry concessions. Cyprus is a member of the European Union, and plans to adopt the euro currency in 2008. The economy in the northern Turkish occupied part of the country is however less advanced, with agriculture and government service being the main employers, the Turkish lira being the currency, and foreign investment highly restricted - necessitating significant financial subsidies from Turkey.